atrium, providing a naturally-lit arrival and navigation space for patients, visitors and work teams. Estates and led by John Cole, then Director of Health Estates Investment Group for Northern Ireland. 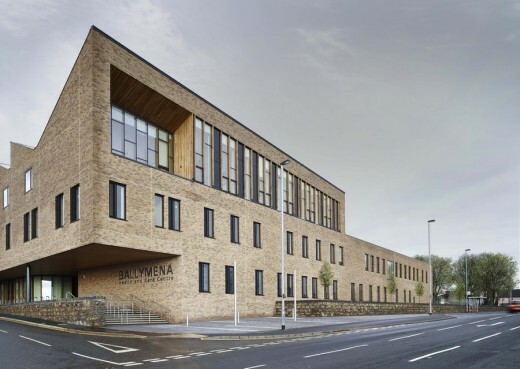 Ballymena, Northern Ireland demonstrated experience and ability to deliver a high standard of quality in Health Care environments along with an expertise in the planning of complex facilities. • Workstations for the above clinical departments and associated services such as social care and district nursing. Road, approximately one mile north of Ballymena town centre. community hospital services to the Ballymena community. Road to the north of the existing workhouse building, was identified. 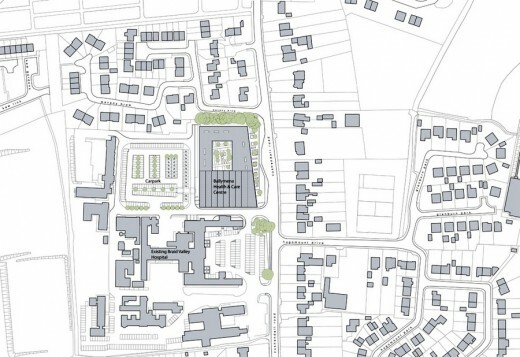 • To address the incongruous scales of the existing workhouse and residential buildings. • To provide a positive presence on Cushendall Road and reinforce the existing building line. • To create clear entrance(s) and legible internal circulation and communication spaces. • To have a views to outside spaces and primary communication spaces from patient waiting areas. • To maximise naturally lit and naturally ventilated spaces. • To have a simple and robust architectural language to complement the existing workhouse building. 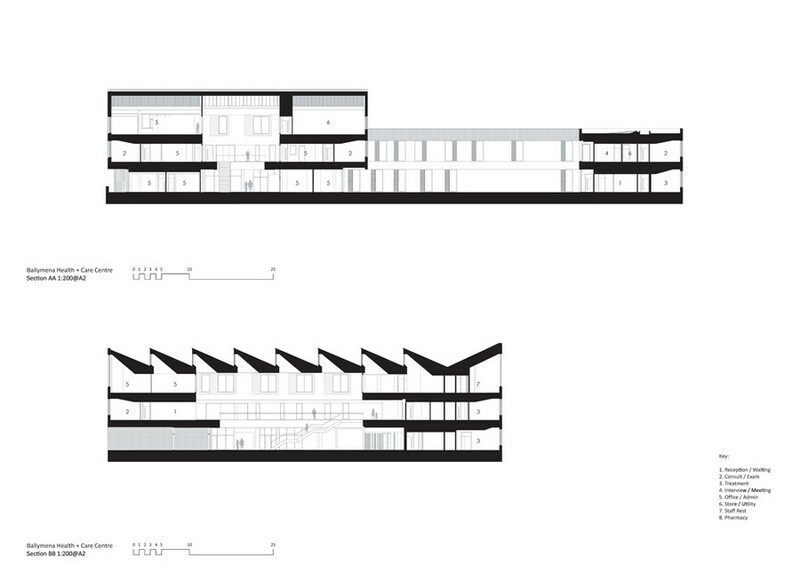 layout with the atrium & courtyard acting as focal points, improving legibility. area located in the north-west corner of the building, separate from the public approach routes. building with the final sawtooth turned to address Cushendall Road. landscaping, with shared surfaces and a tree-lined pedestrian walkway which leads directly to the west entrance. departments, which are organised around the atrium and courtyard. views and access to the courtyard garden. outpatient and community clinics with the wider building. to daylight and natural ventilation, with store rooms/wc’s etc. occupying the internal spaces. the staff working here has a connection to the whole of the Health and Care Centre. One of the most apparent issues drawn from the site analysis was the fragmented nature of the existing context. 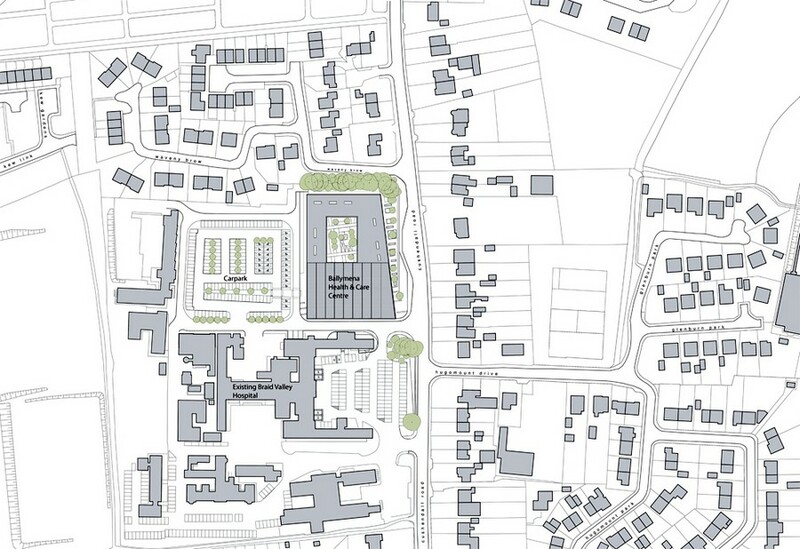 this context, the workhouse stands out as a public building, compared with its predominantly residential neighbours. This is achieved through its form, mass and finishes. • Material should reinforce public nature of the building. ventilation, privacy and sun shading. 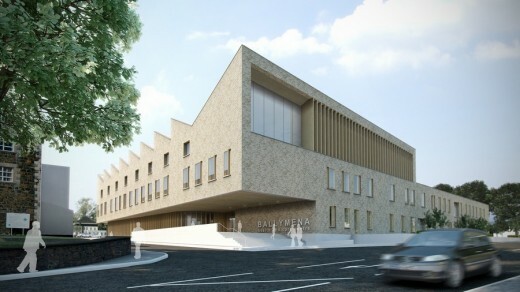 Ballymena project is the first of three Health and Care Centres to be designed for the Northern Trust. Officially opening on the 18th February 2016 (by Simon Hamilton, the Minister for Health, Social Services and Public Safety in the Northern Ireland Executive), the new building is designed around a welcoming, three storey entrance atrium, stepping down to a two story block formed around an external courtyard space. 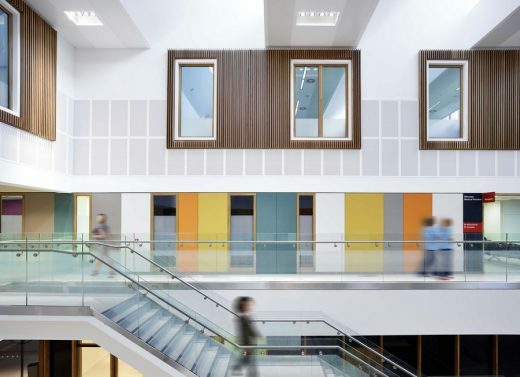 The atrium and courtyard create a highly legible layout, providing clear user wayfinding and orientation, while maximising opportunities for natural ventilation and daylight. Lead architect Keppie, in collaboration with Hoskins Architects, spent considerable time with the various departments and operational and facilities user groups, to ensure that the clinical adjacencies, patient journeys and materiality have been configured to form a clear, cohesive and calming building, from a hitherto disparate range of accommodation and services. Our ambition was to create a calming and caring environment for both visitors and service providers, while forming an appropriate civic addition to the town on Cushendall Road. The new building is reflective of the hard work and dedication of the entire construction team, our collaborative Architects at Hoskins and not least, the dedicated Client group”. Keppie are one of the UK’s leading, independent architectural practices offering services in architecture, interior design and planning. Headquartered in Glasgow, the company employs over 160 people in studios based in Glasgow, Edinburgh, Perth, Inverness, Aberdeen and Manchester.